The Dewalt Buffer review is a must read before you buy! The DeWalt Buffer represents one of the industry's top picks of high-speed car buffers and polishers. I personally rank it as one of my top picks when it comes to professional grade car polishers. For many people the choice can be a difficult one if you lack industry experience, and helping you understand the differences in order to make an informed decision will be the ultimate goal of this DeWalt polisher review. The industry is continually coming out with more and more quality car buffers; which in my opinion represents both the good news and the bad news. Follow along as I lay out important deciding factors anyone should consider before buying. Before you can decide on the top rated car buffer for yourself, many people will be unsure in deciding between the rotary (high-speed) buffer and the random orbital car buffer. My simple answer is that most of you will likely be happier with the winning balance of a top-rated random orbital. If you are unsure as to which car polisher is the right choice for you and your world, see my Car Buffers Review: picking the best buffer for yourself. "What most people don't realize is that nothing will match the speed of a quality rotary car polisher when it comes to compounding. Getting from point A to point B cannot be matched with any DA buffer regardless of what you have read or heard for heavy duty compounding." The winning balance of performance and price! 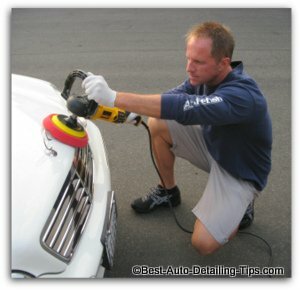 One of my top picks of rotary car buffers. Wide spread of uses; cars, boats, RV's. etc. Can be used with both foam and wool pads. Swirl free finish is very possible with the very low operating speed set at 600 RPM's. Now ideal for any true beginner looking for unlimited potential of polishing tasks. Built to last and perform in the professional world. Unlike old school high-speed car polishers, these newer models start at a very low 600 RPM speed. Before the introduction of DA biuffers and the fanfare these car buffers receive, deciding between a car buffer was limited to deciding between brands only, not the different types of car buffers. If you plan on reaching the top level of all forms of polishing and the ability to work on anything from car, boat, or RV, you are going to have to step up to a rotary. Also the rotary in the right hands can turn out high level paint correction in far less time than any random orbital DA buffer will ever be able to do; despite the endless opinions from guys who don't even know how to use a rotary car polisher. Look in any body shop and you will not see a single random orbital; there is a reason for this and it's all about speed. There is still a lot of fear associated with these rotary, high-speed car polishers. And the DeWalt buffer is one of them. The industry has responded by making these polishers not only variable speed, but have a very low operating speed that can be set to 600 RPM's. Any beginner can now get a rotary polisher and start off safely and slowly (literally) by setting the polisher to 600 RPM's. Since the DeWalt Buffer can be dialed down and set to such a low speed, you can now do what is called finish polishing, or "jeweling". 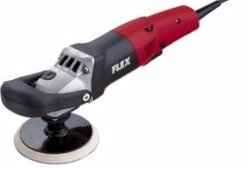 This ultra low operating speed allows for a truly hologram and swirl free finish if you also adjust down the polishing pad to a foam pad, along with a finishing polish. Now that you have become one of the minority in this world called the informed, do me a favor and pay this page forward to any of your forums, social media, or Facebook groups.